Having purchased a plot of land between two houses on Church Lane, Temple Normanton, our clients appointed us as lead architect to design a new eco home that sits appropriately on the street between two existing houses. Their spatial requirements were fairly straight forward, to provide a large living kitchen, separate lounge and four bedrooms to accommodate their family. However they were also looking for a low impact, environmentally friendly home that minimised running costs once built. The site is situated between two existing dwellings; a fairly new, brick built bungalow to the south and a more traditional and historic stone build house to the north. There was no set house type, architectural style or building material present on the street scene to determine the design. However, the site did have a noticeable slope from the bungalow down towards the cottage to the north. This presented us with our first major design constraint, whatever we formed on the site had to be carefully considered to ensure that it did not become to dominant against either property. Working closely with the local planing officer, we quickly determined that the roof of this new property must not be higher than that of the adjacent bungalow and should form a natural transition between the two adjacent homes. 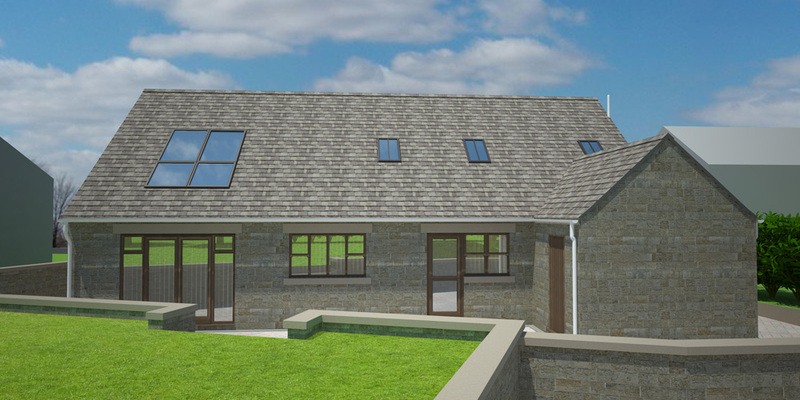 A dormer bungalow was clearly the most appropriate solution to ensure we could maximise the use of the site to meet our clients spatial requirements whilst reducing the ridge height sufficiently to bridge the site. Stone has been used to form the walls, this gives the property a more traditional character and is more sympathetic to the historic cottage to the north. Extra visual interest has been achieved by forming a feature gable and decorative dormer windows to the front whilst an attractive timber framed canopy over the main entrance completes this stunning, yet subtle, new build home. Having studied the merits of a number of construction systems we decided to use NUDURA's 'ICF' (Insulation Concrete Formwork, look out for a separate article on here shortly) to offer the best thermal performance for walls. This system offered a much higher thermal performance when compared with other manufacturers and timber framing options. The thermal value of this property is almost three times better than that of a new build home which has been built from traditional methods. To compliment this, we have provided extremely high levels of insulation in the floor and roof, with an additional thermal membrane over the roof that is lapped onto the ICF, forming a fully sealed, super insulated new build home. The house is to be a fully sealed air tight property, so a heat recovery system is to be installed. A heat recovery system uses sensors to detect heating requirements throughout the home and extract heat from warmer spaces (for example the kitchen whilst you are cooking or the lounge whilst the log burner is on) and distribute this heat around the home. This drastically reduces the need for traditional heating methods and as a result no boiler is to be installed. Instead, an air source heat pump is to be installed to the rear of the property to provide hot water.